getcalc.com's Thermal Expansion Coefficient Calculator is an online mechanical engineering tool for material analysis to calculate the ratio between engineering strain (ε) to the change in temperature of the material, in both US customary & metric (SI) units. 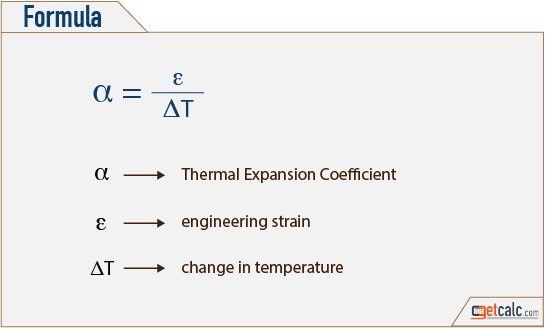 Thermal Expansion Coefficient is the ratio between engineering strain (ε) to the change in temperature of the material. It's one of the many fundamental analysis in material science to measure the deformation of material due to applied force & change of temperature.